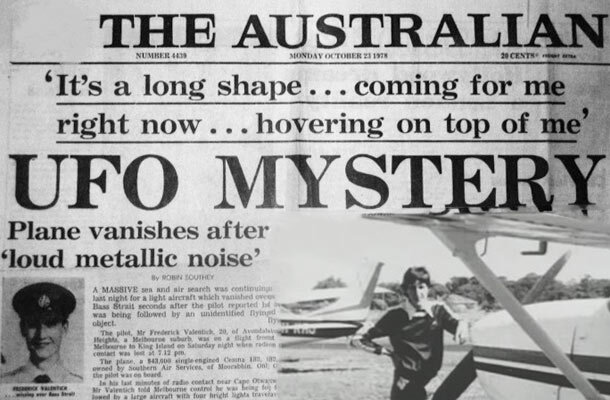 On the night of October 21, 1978 Frederick Valentich radioed into air traffic control in Melborne with some strange news. An unidentified metallic craft was toying with his Cessna as he flew over the Bass Strait en route to King’s Island. No one ever saw him or his aircraft again. 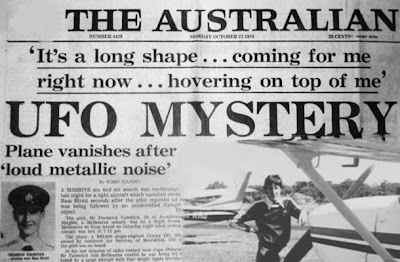 It all happened during the largest wave of UFO sightings Australia had ever seen. Over fifty reports were uncovered from the area of Valentich’s disappearance on that day alone. Some reported classic cigar-shaped craft while others saw a “starfish-shaped” object with lights that looked like “silver rain.” Electronic interferance was noted in a number of these reports. Some witnesses even said they saw a “green light” shadowing Valentich’s aircraft on the night in question (take note of that for later). 19:10:19 DSJ: Delta Sierra Juliet, Melbourne, it seems like it’s chasing me. What I’m doing right now is orbiting and the thing is just orbiting on top of me also. It’s got a green light [emphasis mine] and sort of metallic like, it’s all shiny on the outside. FS: Delta Sierra Juliet, Confirm the – er - aircraft just vanished. 19:11:50 DSJ: Delta Sierra Juliet, the engine is rough-idling. I’ve got it set at twenty three twenty-four and the thing is (coughing). DSJ: My intentions are – ah – to go to King Island – ah – Melbourne. That strange aircraft is hovering on top of me again (open microphone for two seconds). It is hovering and (open microphone for one second) it’s not an aircraft. These final seventeen seconds of open transmission revealed only a “metallic, scraping sound” on the Melbourne Service Unit’s tape recording. Despite analysis by a former NASA researcher and the Royal Melbourne Institue of Technology, these sounds remain a mystery. The final piece of this puzzle is the photograph taken by Roy Manifold. He had set up a timelapse camera to capture the sunset off the coast, but found something strange when developed. There appeared to be an unexplained object with an “exhaust cloud” in one of his pictures. According to Roy, these were taken just 20 minutes before Valentich’s last transmission. Experts at an Arizona-based UFO organization analyzed the photos and concluded that the object must be moving at 200 mph, or hovering stationary while the clouds zoomed past at that speed (an equally puzzling feat). Below is an enhanced version of the original photograph, provided for your scrutiny. Could this be the UFO that kidnapped Frederick Valentich?